Ok, first things first. If you are a person who is very sensitive to apparently realistic cinematic depictions of violence then this is most definitely not the flick for you. People are threatened, slashed, beaten, shot, stabbed, bitten, bludgeoned, spat at, choked, cut open, punched, kicked and otherwise harmed. Gender, age or formerly pacific nature is no protection from harm and no predictor of violent capacity. Anyone can get got and does. 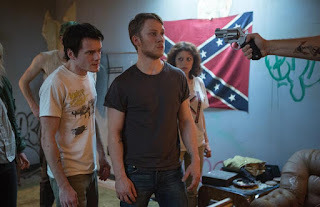 This movie is mildly transgressive not so much in its violence but in its unspoken assumption that despite their loathsome political and racial views and glorification of violence, white supremacists, white nationalists and Nazis are human too. I DEFINITELY don't mean this in any sort of goofy let's all find each other's humanity and love each other way. Only a masochist would love someone bent on their destruction. No rather, like any other group of humans, the bad guys here make mistakes and have internal romantic and business rivalries. They have a Bell Curve population distribution of leaders, followers, cowards and people who will go along to get along with whoever appears to be in charge. Just like Hitler loved his dog, a Nazi dog-handler is greatly dismayed anytime someone harms or misuses his animals. New information or a new perspective can make someone who was previously determined to kill you become an ally. This also works the other way, obviously. There may or may not be a world beyond our own but this world already has plenty of angels and devils in human form who are far more depraved or beatific than anything we could dream up. And some of them probably work and live right next to you. 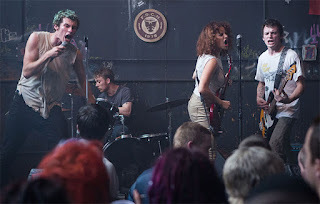 The Ain't Rights are a gritty punk rock band who haven't exactly fallen on hard times, because apparently they've never had too many good times. The only positive thing you could say about them is that they usually earn just enough money to make it to their next gig. Barely. Sometimes, well more frequently than they like, they have to steal (siphon) gas from other vehicles to make it to their shows. Tiger (Callum Turner) the singer, Reece (Joe Cole) the drummer, Samantha (Alia Shawkat) the guitarist, and Pat (the late Anton Yelchin) the bassist, drive their own van, set up their own gear and evidently aren't even well known enough yet to have groupies. That seems like a pretty crappy lifestyle for a band-no money, no roadies and no groupies. It doesn't help matters when one of the sleep deprived musicians falls asleep at the wheel of the van, leaving the engine running. But that's the life they've chosen, and they still love it. They are apparently young enough not to have spouses nagging them about getting a real job or needing to worry about children's college costs. But like the Albert King song Born Under A Bad Sign goes, if it wasn't for bad luck, they wouldn't have no luck at all. A gig that was supposed to bring them "big money" (i.e. hundreds of dollars each) is not as lucrative as promised, netting each member about $6. The magazine interviewer who was going to help break the band's music to a larger audience neglected to mention that he just got fired from his job. So the interview won't run. But never fear! He has a cousin who knows someone who can arrange The Ain't Rights a better paying opening act gig in a town near Portland, Oregon. The only drawback is that the audience will probably tend a bit more overtly right-wing than the band is used to drawing. But beggars can't be choosers, right? Right-wing money spends just as good as anyone else's. As long as The Ain't Rights keep their mouths shut off the stage and stay away from any overtly left-wing political statements they should be ok. After all they're all part of the punk scene. The band arrives at the club. The good thing about this gig is that the bouncers and managers are more professional about the money, the time and the sound. The bad thing is that the bouncers, managers and apparently all of the audience are white supremacist neo-Nazis. The style of dress, signs and graffiti all make it clear that this club is a no go zone for anyone who is non-white and/or to the left of George Wallace. As a joke and as a middle finger to the audience the band opens with an anti-Nazi Dead Kennedys song but swiftly moves to other material once the audience becomes a bit unruly. But music can soothe the savage beast. Before long everyone in the club is peacefully grooving to the music, or rather doing whatever passes for grooving in the Pacific Northwest. After all, this is an area that, Ray Charles, Quincy Jones, and Jimi Hendrix notwithstanding, is not exactly known for funk or soul. The band finishes their set to applause. They get paid and start to leave. All's well that ends well. That is everything is just peachy until Sam realizes she left her phone charging in the green room, where the headliner band is preparing for their set. Pat runs back to retrieve the phone but has the misfortune to see something that everyone agrees he would have been better off not seeing. Hearing his dismay the other band members come running and also become witnesses. 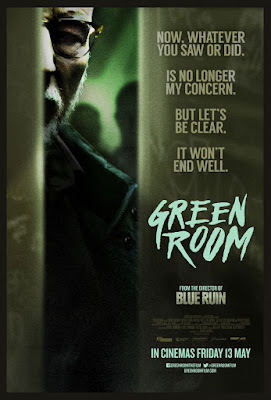 With that the ambitious head bouncer Gabe (Macon Blair) locks the band in the green room until he can decide what to do. Or rather he locks the band in the green room until he can contact his boss Darcy (Patrick Stewart) and Darcy can decide what to do. Locked in the room with the band to keep an eye on them is the large, physically intimidating and armed bouncer Big Justin (Eric Edelstein). Also in the room is Amber (Imogen Poots), a woman who constantly says she's not a Nazi though she may be a girlfriend of a Nazi. Amber is someone you want to watch out of the corner of your eye. As you might expect Stewart does a good job with a limited role that might otherwise have been cartoonish. His dulcet baritone and obvious leadership status makes you and some of the people inside the room want to believe that everything can be worked out. Obviously Darcy means that everything can be worked out for him. He couldn't give a **** about most of the people in the room. He has some ideas he'd like to try. And if nothing else his ideas will give some of his more dangerous followers a chance to get in some practice. The light and sound was realistic throughout this film. I was impressed. Often in movies like this the sound levels can vary and drown out dialogue but that wasn't a problem. The tension feels very real in the film. There are a few surprises judiciously spread throughout the movie. The acting is strong. This is a horror movie but without anything supernatural. The monsters are all human. There are a few plot holes and people doing stupid things to move the plot along but much fewer than you might expect. The plausibility of much of the movie is what gives it its edge. Well, it's the plausibility and Patrick Stewart. If you can appreciate siege films or movies where one slip up changes everything then you'll enjoy Green Room.